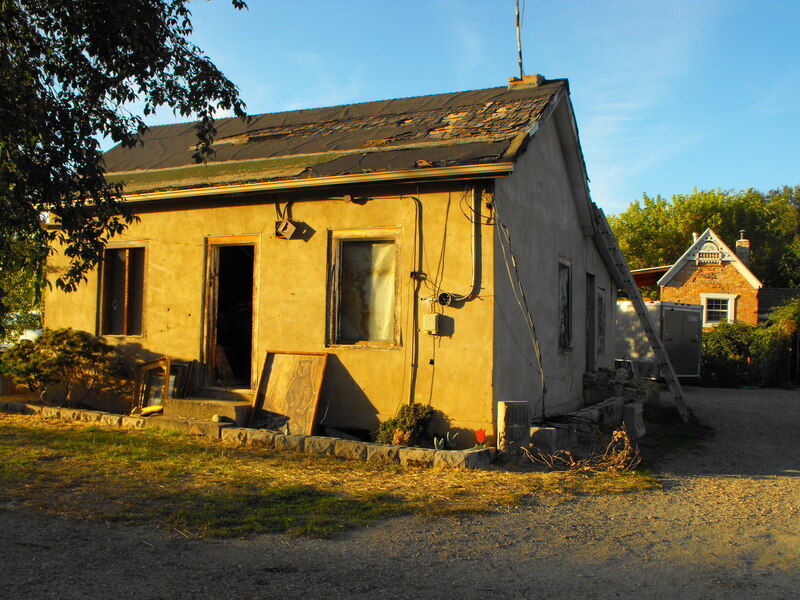 BEFORE: The update of the c. 1866 house began in the fall of 2010. 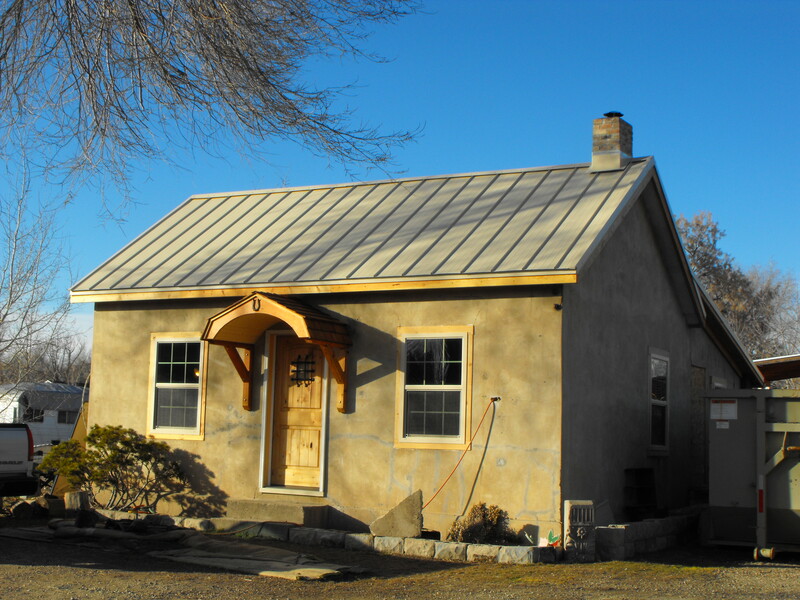 AFTER: It was designed to retain the English look of a vernacular hall-parlor house; photo Feb. 2011. 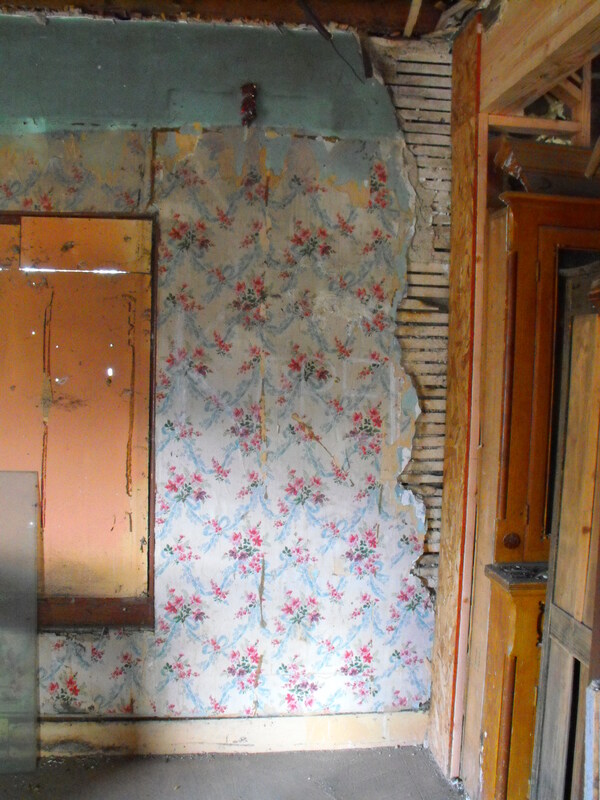 In the main room the wallpaper, lath and plaster was removed. 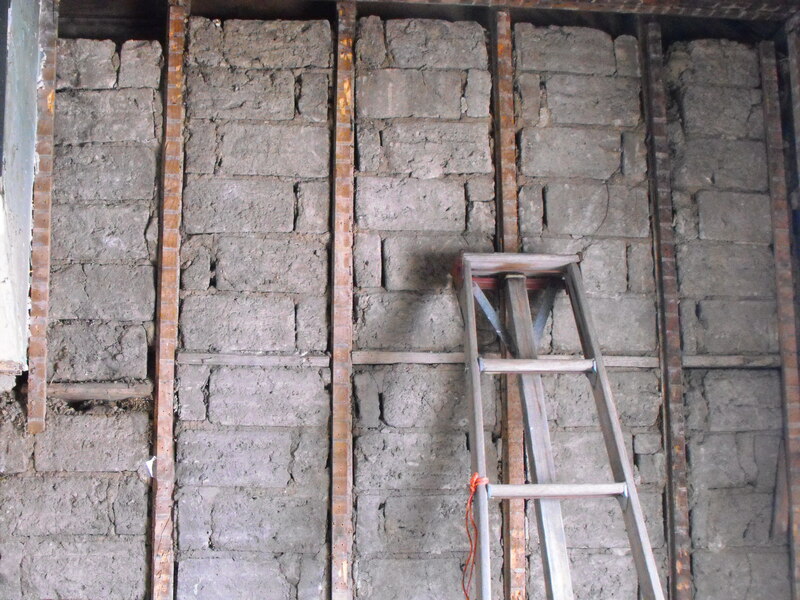 Interior walls of main rooms are now back to the basic adobe walls between studs. 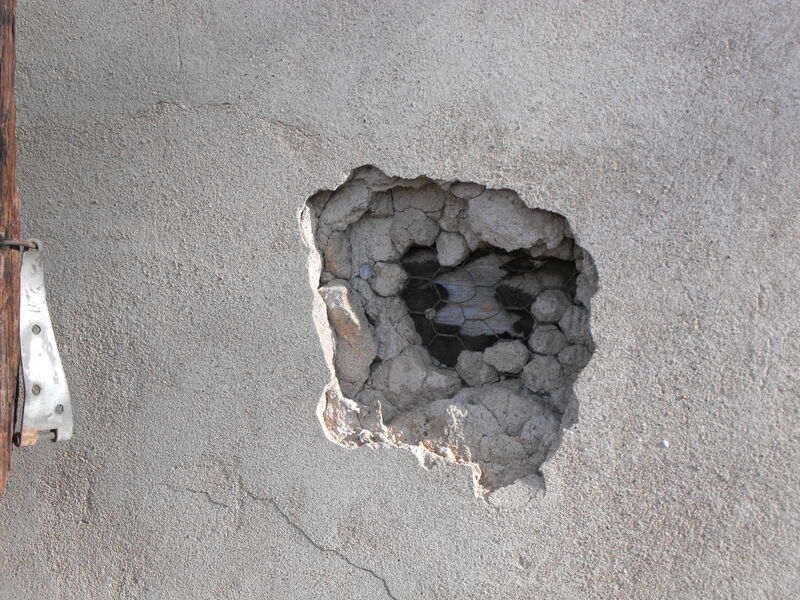 A hole in the exterior wall of the main room reveals original board exterior at the bottom of the hole, chicken wire, and a cement/stucco covering that was applied many years ago at an unknown date. Square nails in door frame. 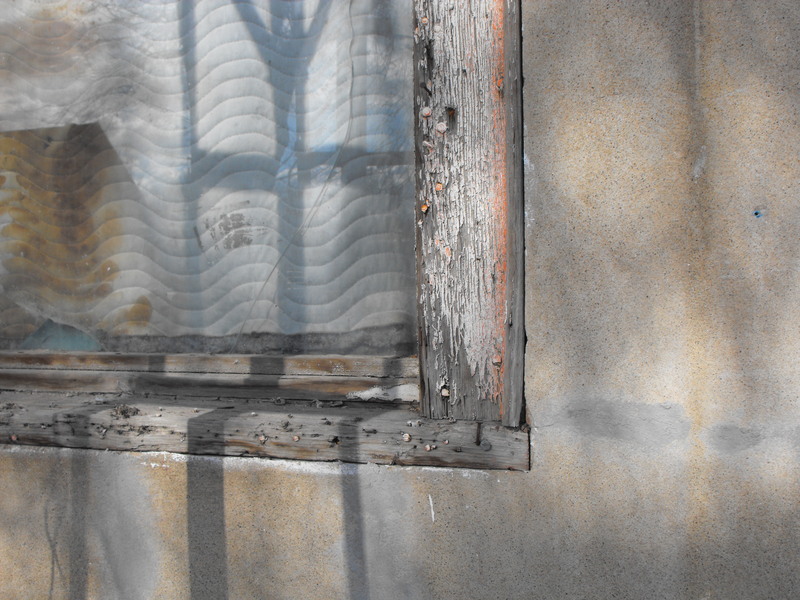 Square nails in window frame. 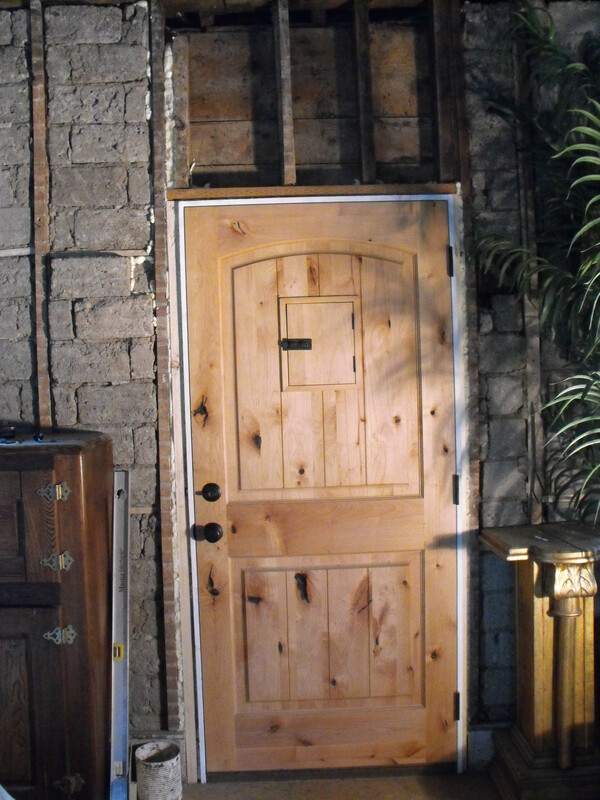 Doorway is small, 28 x 78 inches. 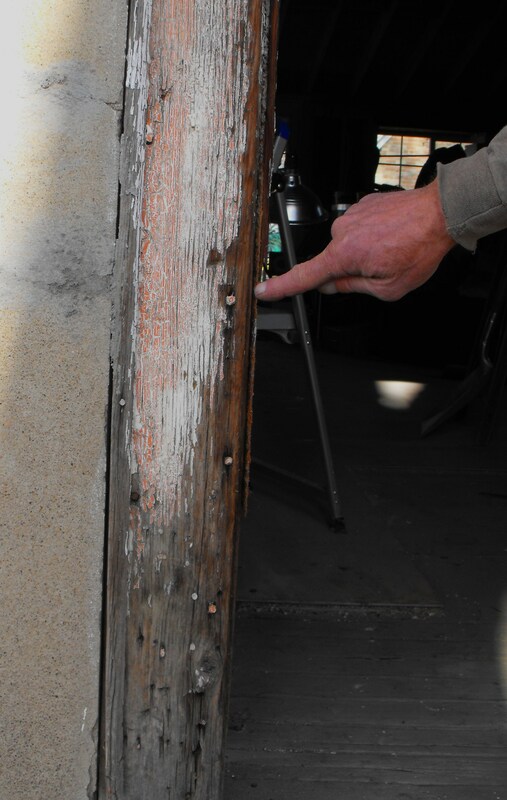 The interior view of the new door shows a glimpse of outside board wall above the door where the adobe bricks were removed; the other side of the board wall is covered with cement/stucco. Looking up at the peak of the roof from the inside of the house to read letters UPRR. 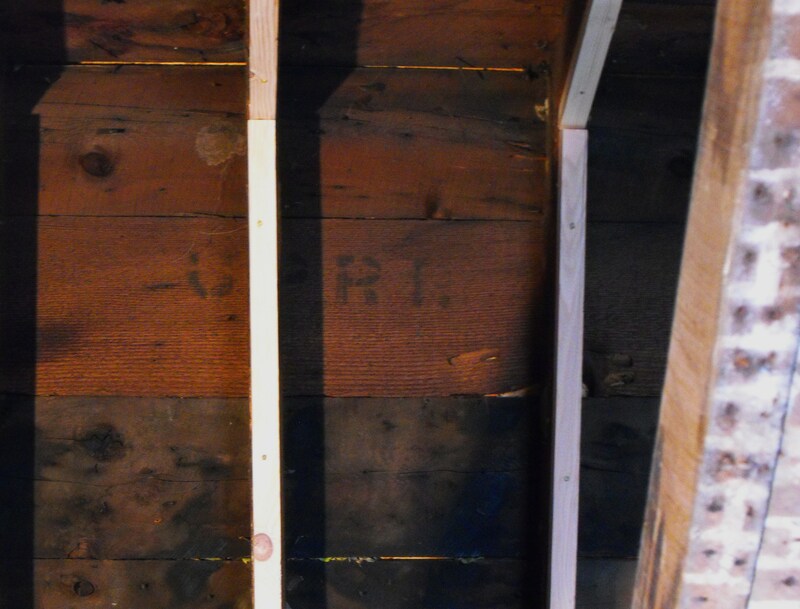 The interior peak of the roof in the main room shows older roof boards below and replacement boards above from another era showing letters UPRR,Union Pacific Rail Road. 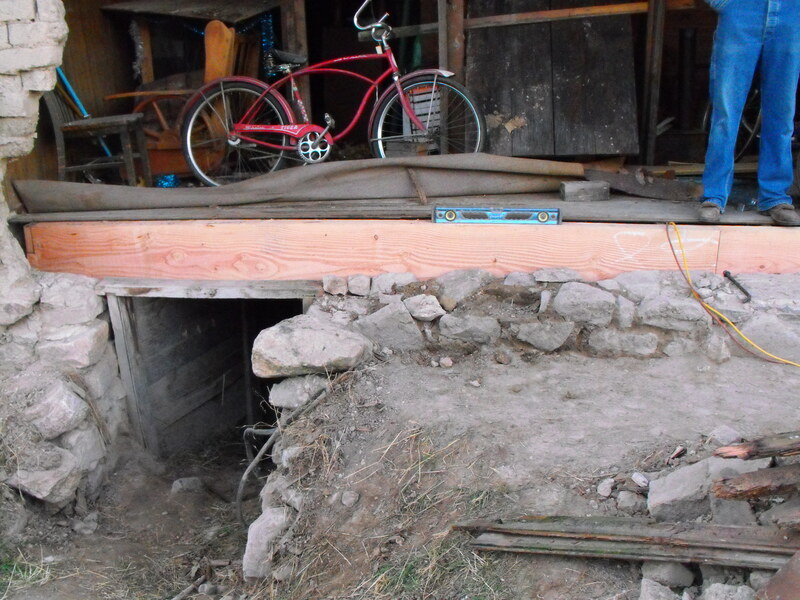 BEFORE: Rear wall of lean-to stripped of adobes which are stacked on the right. 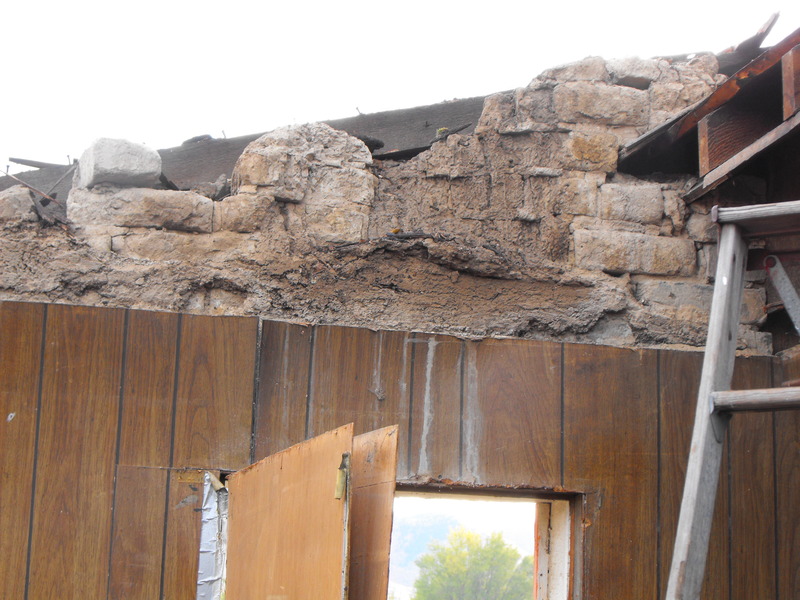 The rear wall of lean-to was in the worst shape; the unprotected adobe had deteriorated over the years. 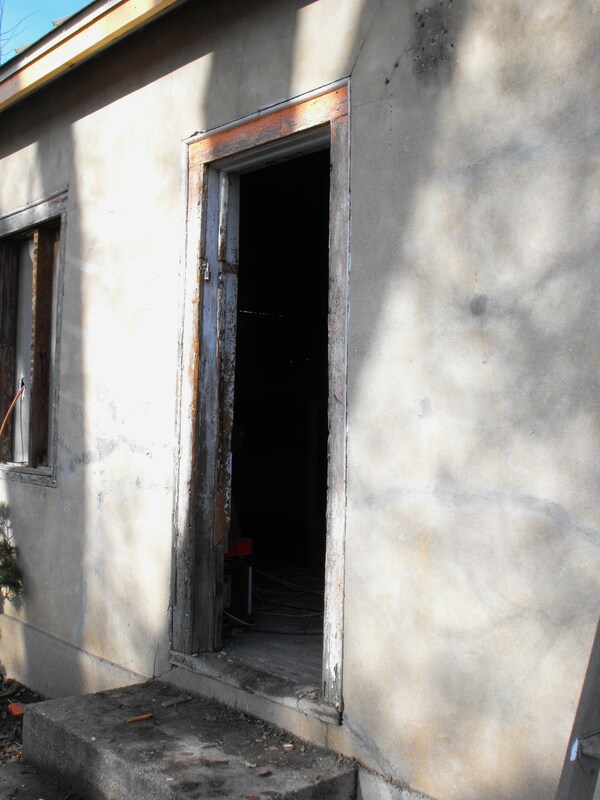 BEFORE: Corner of rear wall of lean-to. 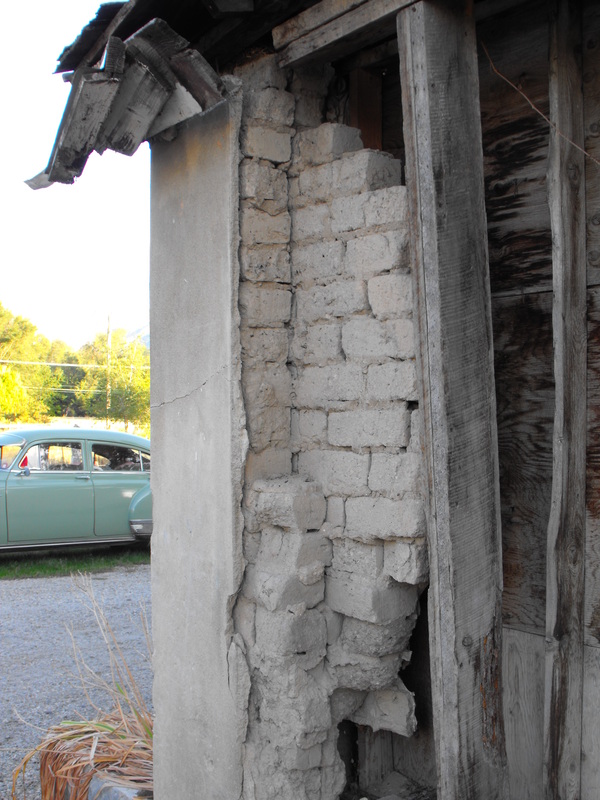 Two layers of adobe bricks made the walls of the lean-to. 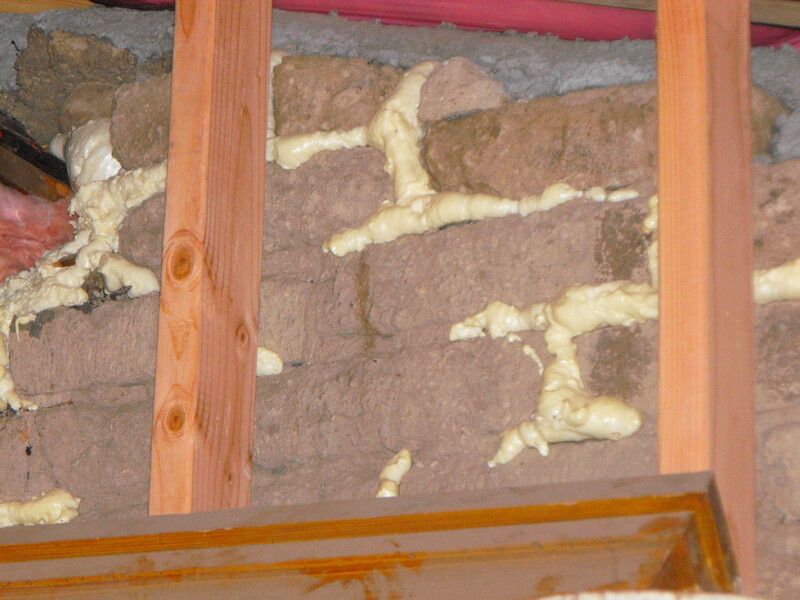 Foam insulation was placed between the adobe bricks and new fir studs in front of them. 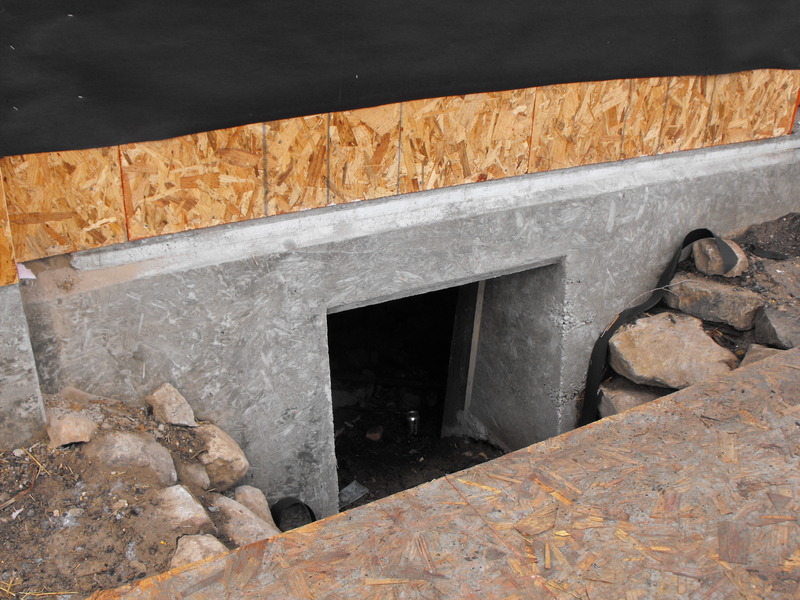 BEFORE: Cellar entrance under lean-to. AFTER rear wall of lean-to. 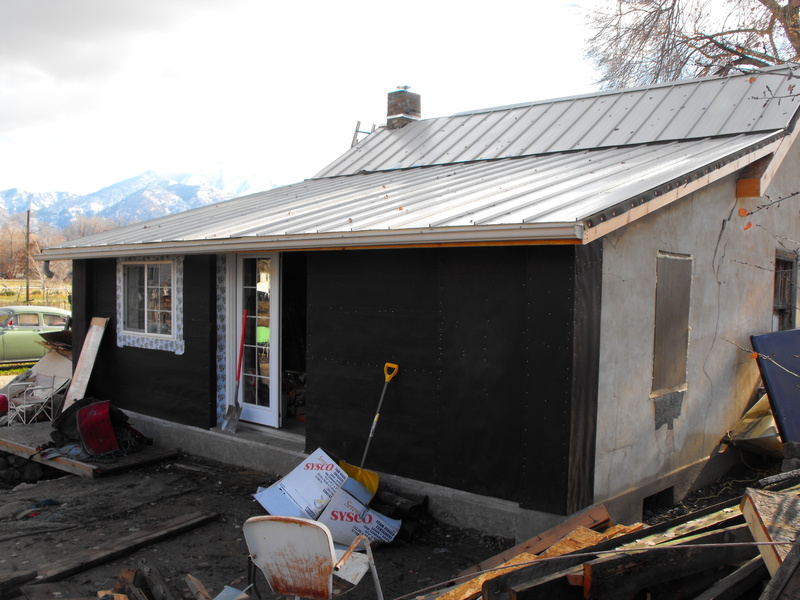 The rear wall was covered with tar paper and the structure stabilized with 6 x 8 douglas fir beams with a center post in the basement. 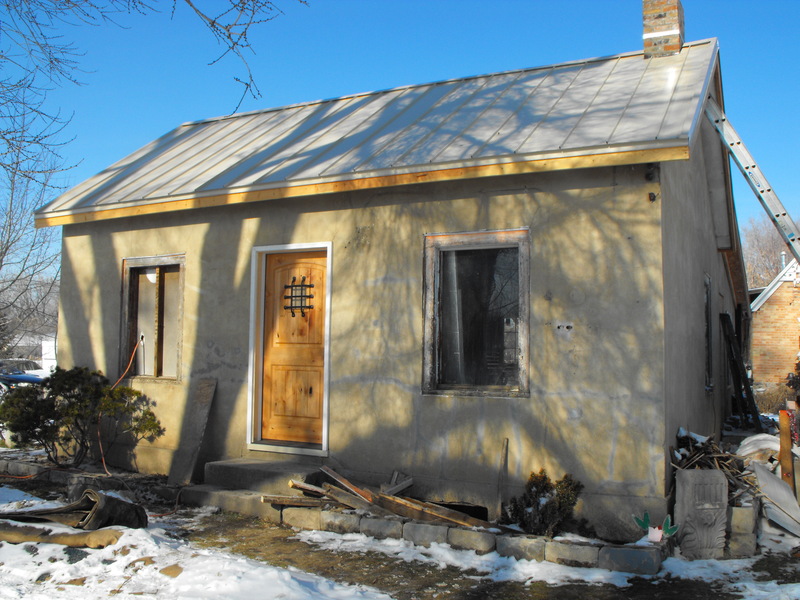 The side walls of the lean-to remain covered with cement/stucco. 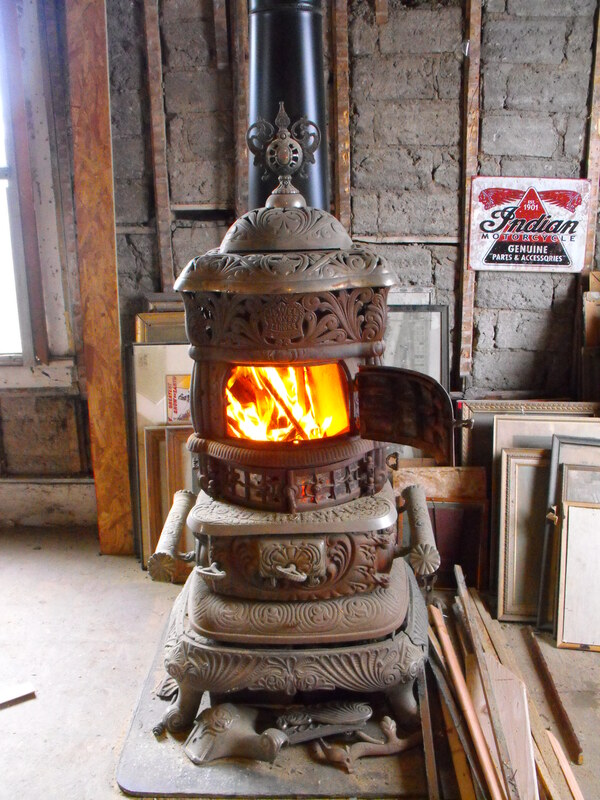 Keeping the room warm on a cold day.